After all the hubbub of the 2017 National Hockey League Expansion Draft is complete, the league’s 31 member clubs will immediately pivot and head to Chicago for the annual NHL Draft. 217 prospects will have their immediate NHL futures set as the clubs try to bolster their reserve lists with young talent. The Calgary Flames have been one of the more active teams at recent drafts, notably adding Dougie Hamilton in 2015. This year they seem to have gotten their work done early, acquiring goaltender Mike Smith prior to the expansion draft roster freeze. Even with their biggest off-season challenge seemingly met, the Flames will probably still be a team to watch at this year’s event. Heading into draft weekend, the Flames have five picks at their disposal. It’s the fewest picks they’ve had during Brad Treliving’s tenure as general manager. Their second round selection was sent to Ottawa at the trade deadline for Curtis Lazar. Their third round selection was traded to Arizona a few weeks earlier for Michael Stone. The Flames have had some success in the draft in recent years, but look for the pattern: Sean Monahan, Sam Bennett, Matthew Tkachuk… They’ve nabbed some high-end forwards in the early stages of the draft, but their system hasn’t really excelled at producing depth forwards and so they’ve had to obtain them via trade or free agency. To succeed in a cap system long-term, that’ll need to change. The club has Morgan Klimchuk, Dillon Dube, Andrew Mangiapane, Matthew Phillips and Eetu Tuulola in their system, but they need more options at their disposal. One of the strength areas in development has been the Flames’ defensive group. Adam Fox, Rasmus Andersson and Oliver Kylington anchor a pretty strong group, but with the departure of Brandon Hickey the organization is light on shut-down defenders and can always use more right shots. The Flames are doing fine in terms of goaltenders, boasting the likes of Tyler Parsons, Jon Gillies, David Rittich and Mason McDonald in their development pipeline. Tod Button has been the club’s head of scouting since the 2001-02 season, having been promoted into the role by his brother Craig when he was Flames general manager. This will be his 16th draft as head of amateur scouting – spanning four different general managers (and interim GM Brian Burke). In 15 previous drafts, Button’s results are a bit mixed: he has successes like Dion Phaneuf and Mikael Backlund, but has also had a hand in selecting a bunch of first round picks that nobody has ever heard of. The Flames have had better results over the past four years, with Monahan, Bennett and Tkachuk heading directly to the NHL and staying there. Since Treliving’s arrival in 2014, the Flames have made 20 selections in the draft: two goalies, seven defensemen and 11 forwards. They’ve selected eight players from the Ontario Hockey League, four from the Western Hockey League, four from Sweden and the rest from a mixture of other leagues. 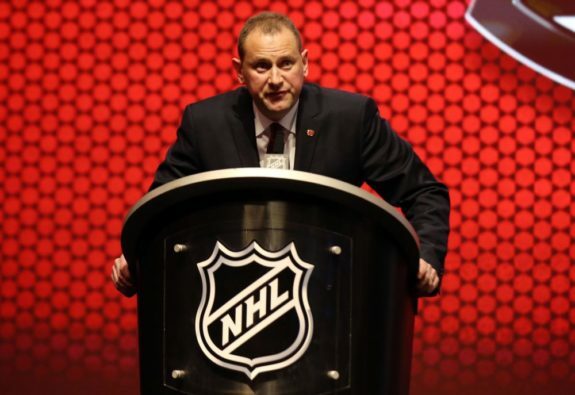 Given the successes of the players they’ve selected from the WHL, OHL and Europe in recent drafts, you would expect those scouts would be listened to at the draft table in the event there’s a toss-up between players. Based on the team’s draft status, tendencies and needs, there are a few players expected to be available in the middle of the first round that would be good fits for the Flames. USHL sniper Eeli Tolvanen, a Finnish-born winger who’s spent two seasons in North America. OHL center Nick Suzuki, one of the best 200-foot players in his league. Finnish-born SHL forward Kristian Vesalainen, who’s big, talented, has played a couple seasons of pro hockey and can play both wings. Swedish forward Lias Andersson, a talented SHL scorer that can play all three forward positions. Kelowna defender Cal Foote, who plays with Flames prospect Dillon Dube and has NHL bloodlines. Swedish defender Erik Brannstrom, who has size and two-way ability. Swedish defender Timothy Liljegren, who has slid down rankings this year due to a bout with mono but, like 2015 Flames pick Kylington, could offer tremendous value if he falls to Calgary.